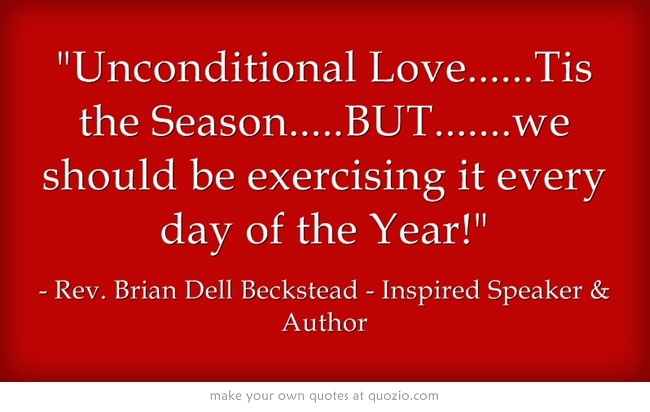 The season of unconditional love CAN I GET AN AMEN? When we think of unconditional love we think of or at least I think of our children. The love of your child is the ultimate in unconditional love. Think about your child, how much you love them. Now, think about handing them over to be kill in what must have been the most horrible way for the sins of others no less. Do you think you could do that...could you knowing send your child to die to repay the sins of others? It is mind boggling isn't it? 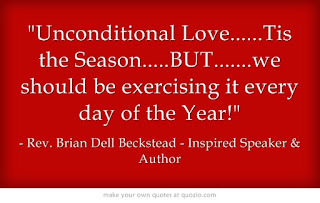 This is the ultimate in unconditional love and what I would like to ask of you is to keep even 1/10000000 if this kind of love in your heart all year long. If you do maybe, just maybe you will enjoy a better and happier life. Maybe the next time someone is in line behind you in a store with one item you will let them cut in front of you. Maybe the next time you see one one needing help of some kind that might take a bit of your time you will stop and help them. I am not asking you to give up your child for the sins of others just to be kind. Have a wonderful blessed Thanks Giving, a very Merry Christmas and a very Happy and Safe New Year. Bless you and yours this Holiday Season may all the lives you touch better the life of others.